Released: March 2011. Genre: Racing. 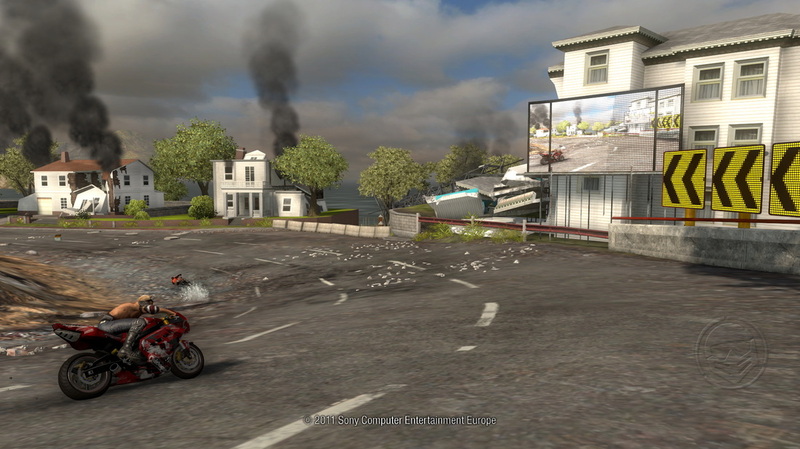 MotorStorm Apocalypse stands as a prime example of why some games are deserved of more than a cursory judgement. Play it for a day, and the familiar mechanics, simplistic Festival mode and kitsch urban-apocalypse theme will have many sensing the end of the line for a series that’s past its best. 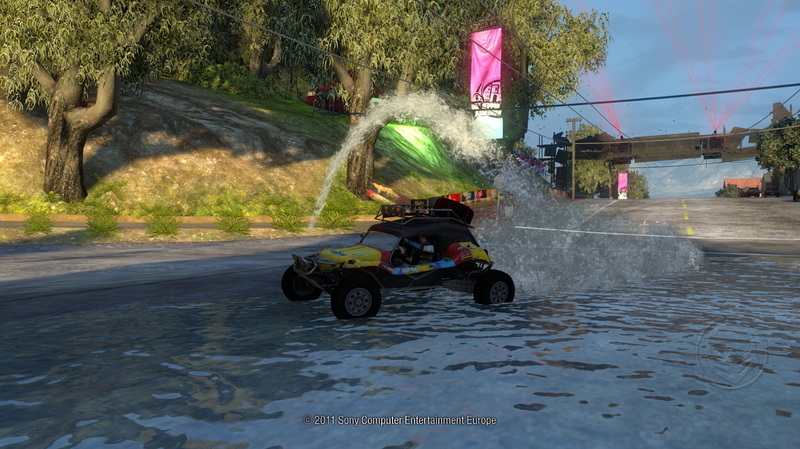 All it needs though is some time; if you’re willing to spend some on it, you’ll discover the strongest MotorStorm package yet to grace the PS3, and it’s chiefly because Evolution Studios finally got the Online suite right. Apocalypse breaks from the series’ dirt/off-road roots in favour of a volatile concrete jungle situated on the American west-coast. Up to sixteen competitors slug it out in as many as thirteen different vehicle types that range from the vulnerable but speedy bikes to the bulky but lumbering Monster Trucks and Big Rigs, with the superminis, supercars and racing trucks ending up somewhere in-between. It’s about finding the right mix, because Apocalypse is as much about survival as it is speed, as nutty opponents and treacherous, crumbling locales prove as much of a hazard as the corners themselves. Its Jekyll and Hyde nature is still very much in evidence, causing delight as you ram opponents into pillars and frustration following wreckage by a seemingly-innocuous rut in the road. Irksome as the skittish physics can be though, there’s an undeniable, visceral satisfaction to be had charging through the imploding cityscapes, darting between wrecked cars and thinking fast as each lap brings new challenges via the changing landscapes. Gah! It's the dreaded screen-within-a-screen! Apocalypse wins points for being less brain-pummellingly difficult than its predecessors. Make no mistake, there’s still considerable challenge to be found anticipating hazards and learning how cars are going to react to different surfaces, but it comes without the uneasy feeling that you could do a mistake-free race as in Pacific Rift and only be rewarded with a 5th place finish. Whilst the racing itself uses uneven terrain rather than extravagant cornering layouts to the tax the competitors, the selection of vehicles and courses is impressively broad and cohesive. Whilst Dirt 2’s off-road disciplines ended up feeling a little disparate, there’s a pleasant togetherness to Apocalypse’s racing. Generally speaking it’s still well balanced, although the Big Rigs are often too slow to ever put their size to its intended bullying use. The single-player consists of string of thirty-odd races, with the occasional elimination event punctuating the standard race formula. It’s jarringly simple, though this streamlining is ultimately less of a trudge as each race yields a different location and vehicle. 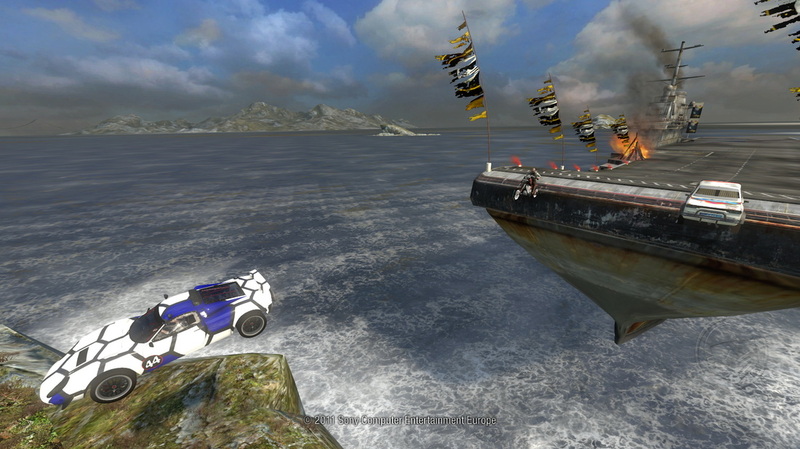 The tracks offer up some dynamic and extreme conditions; the tornado and vicious, swirling winds of the pier are remarkable to drive, whilst the skyscraper courses, which see you performing successive death-defying leaps over roofs and through offices, are similarly exciting. MS’s trademark mix of routes comes into play too, as the braver and more attentive racers will reap the benefits. Whether the series really belongs in an urban environment is a moot point, but the tracks are certainly a lot more adventurous than those that featured in Pacific Rift. The Online mode makes all the difference. Pacific Rift’s was, if we’re honest, rubbish. Punishing players for being beaten was a very poor idea and in retrospect, contributed to a sparse community presence. Being greeted by small lobbies filled with the odd MotorStorm sage seemingly content to thrash one or two newcomers continually, it’s really no surprise so few bothered to stick around. Apocalypse shows Evolution Studios had their thinking cap on though; in a positive move, the game lets you place a risk-free bet on a specific individual pre-race. Beat them, and the chips are yours, and nothing is lost should you fail. It means you don’t have to be brilliant to prosper; you just need to figure out who you can beat. It’s an excellent and very successful philosophy, and one that ensures that whether you’re near the front or the back, every racer has their own battles to busy themselves in. 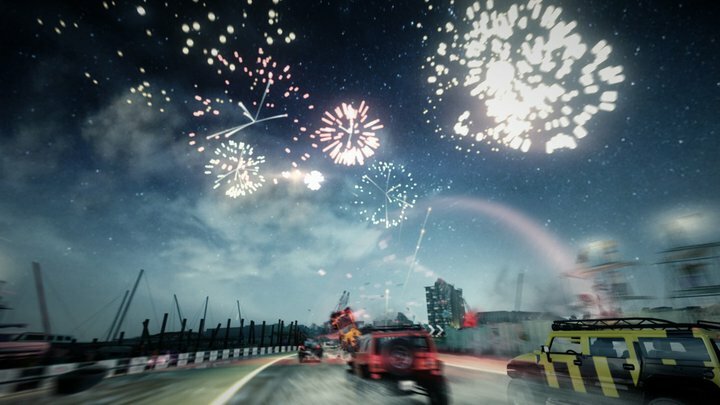 There’s the by-now established selection of pros and cons we’ve come to expect from MotorStorm. There’s an eternally divisive dubstep soundtrack that inevitably isn’t going to suit all tastes, though one has to admit, it does rather suit the action. 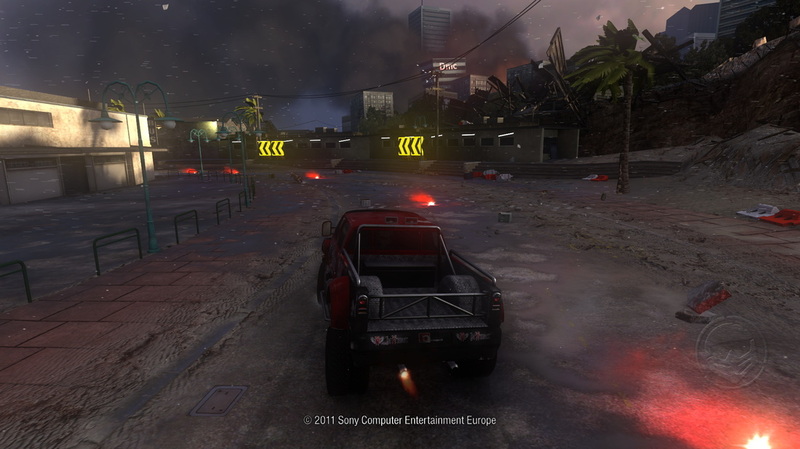 Of course, a technically-heavyweight graphics engine comes as-standard, and delights in showing vehicles buckle in slow-motion and buildings collapsing as you drive, whilst Apocalypse retains a well-placed sense of vanity through its marvellous photo function, allowing the player to pause the game and capture a particular moment of gameplay. Minor handling tweaks, a more lenient learning curve and a significantly improved online suite combine to make Apocalypse a more satisfying racer than those that preceded it. Slightly lengthy load times and stupid, rad rhetoric from an otherwise-likable bunch of misfit racers aside, Apocalypse makes for a thoroughly enjoyable detour from the series usual naturalistic habitats. The basic driving probably won’t sate fans of more heavyweight fare, but for extreme/off-road wheel-to-wheel racing, there’s few better options than this.